Following the ‘lost’ decade of the 1980, the ‘frustrated’ decade of the nineties, the current decade is “South America’s decade”. BUENOS AIRES, June 21 (BERNAMA-NNN-MERCOPRESS) — A new global order is emerging as a result of the world crisis and recession in developed countries and Latin America has a crucial role to play given its very satisfactory economic performance in recent years, Latin Unasur bloc Secretary General Maria Emma Mejia said. Meeting in Madrid for the tenth anniversary of the Spanish foreign affairs think-tank Royal Institute Elcano, Ms Mejia together with other world experts and politicians were invited to discuss the international crisis, the emergence of new powers and if the world is heading for a new international order. Ms Mejia said that the region’s economy expanded 6% last year and is expected to grow 4.5% this year, of which certainly “the U.S and particularly Europe would feel very envious”. She added that “undoubtedly a new international order is emerging and Latin America believes it has a crucial role to play”. However the Union of South American Nations (UNASUR) secretary general admitted that inequality and poverty are the main pending issue of Latin America. In spite of the successful economic performance there are still 124 million people living in poverty. “This is our pending task in Latin America. Inequality and asymmetries are very serious, we have 124 million poor and 13% of our population is indigent, in spite of the huge efforts from countries such as Chile and Brazil” added Ms Mejia. Following the ‘lost’ decade of the 1980, the ‘frustrated’ decade of the nineties, the current decade is “South America’s decade” said Ms Mejia who described the current situation as “most encouraging” as well as regional integration experiences such as Unasur (Union of South American Nations), through which the region can contribute to the world order and economic development. However other guests were not so enthusiastic about the coming changes in the world order and what this could mean. Robin Niblett, head of British Chatman House said the world was not going from an international order dominated by a certain part of the world to one dominated by another part, but rather in coming years “we will have to see how interdependence works out and not who dominates”. In spite of the fact that the current crisis is “western”, Niblett cautioned “not to underestimate the strength of the U.S and Europe”, that have “some of the most competitive powers and corporations” and a “very strong social security system”. Another participant at the forum was Yan Xuetong from the Tsinghua University Institute of Modern International Relations, considered one of the most prestigious institutions of China in this field. “China is not a global power. From an economic point of view China is second in the world but this is not the case regarding political or military influence” said Yan Xuetong, who forecasted that China’s influence in coming years will be “mostly economic”. “China needs plenty of time, possibly twenty years to become a truly world power”, said the Tsinghua university expert, who is also the editor of China’s Journal of International Politics. He added that “the peaceful rise of China will help to strengthen world stability”. The 24-strong bloc of Latin American states known as the Rio Group is to join the Caribbean Community to form a new trade body intended to present opposition to US dominance. What can it really hope to achieve? The Rio Group assertively announced the birth of its successor earlier this week, at a summit in a resort town on Mexico’s Caribbean coast. Mexican President Felipe Calderon declared that a new body had been formed that would represent both the Group of Rio and the 15-member Caribbean Community (CARICOM). 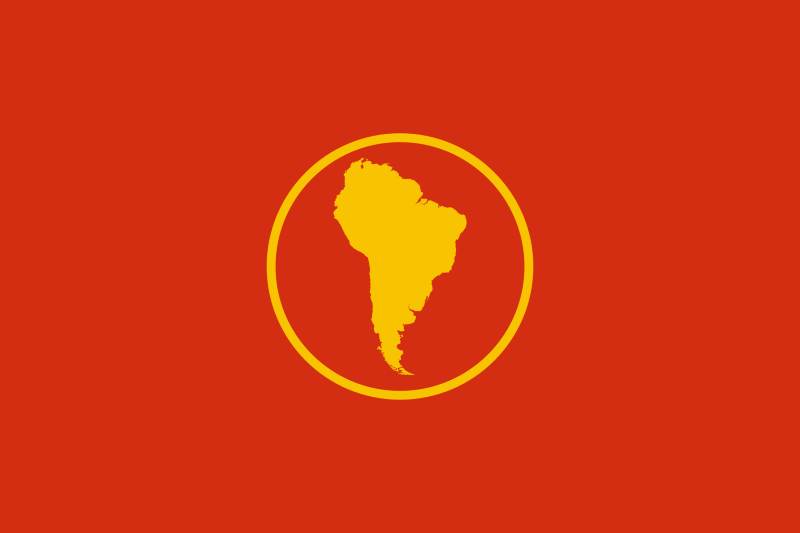 Going under the provisional name the Community of Latin American and Caribbean States (CELC), the newly announced body specifically excluded the United States and Canada from membership, and intends to consolidate the sometimes tenuous solidarity among the Central and South American states. The exclusion of the two North American powerhouses puts the nascent organization in direct competition with the Organization of American States (OAS), established in 1948, over which the US holds decisive authority. The declaration is clearly a statement of South America’s new self-assertion, and comes in the wake of provocative times, as fellow Rio Group states rallied around Argentina in its current dispute with Britain over oil-drilling rights off the Falkland Islands. Nikolaus Werz, political scientist at the University of Rostock, believes that the emergence of the new body will only make Europe’s diplomatic ties with Latin America more complicated. “We need a single point of contact, and this adds another to the long list we already have – the Rio Group, OAS, CARICOM and Unasur,” he told Deutsche Welle. In an interview with South American broadcaster Telesur, Bolivian president Evo Morales lent his own weight to the vision of a South American brotherhood united against the US. Morales was among many who recently voiced concern about the huge US military presence now stationed on Haiti and the summit pledged to send a further $25 million (18.5 million euros) to the earthquake-hit country. But the summit also revealed the many tensions likely to threaten the prospective new bloc. The project nearly ran aground this week on the continuing conflict between neighboring Venezuala and Colombia. Colombia is considered a close ally of the US, and Venezuela often perceives itself under threat. But doubts have also been voiced about the strength and belligerence of the proposed body when it actually comes into being. Few specifics have been revealed about its structure, much of which is yet to be decided, and Rafael Fernandez de Castro, Calderon’s top foreign policy advisor, told the Miami Herald newspaper that the new organization will have neither a building or a permanent staff, and would operate according to a “flexible” program of summits – in other words, CELC would convene either every one or two years. On top of this, the six nations that have been chosen to draw up the new body’s mission statement – Mexico, Brazil, Chile, Jamaica, the Dominican Republic and Venezuela – are mainly countries with no interest in antagonizing the US. The fact that US-friendly Chile takes over the two-year presidency of the Group of Rio in March is unlikely to sharpen tensions within the Americas either. HAVANA – Members of a leftist bloc of nine Latin American nations said Saturday they plan to use a new currency dubbed the “sucre” for trade among themselves starting in January. No sucres will be printed or coined, but the virtual currency will be used to manage debts between governments while reducing reliance on the U.S. dollar and on Washington in general. Cuba already signed an agreement on Saturday to pay for a shipment of Venezuelan rice in sucres, according to Rogelio Sierra, the island’s deputy foreign minister. He declined to say what the shipment was worth. That agreement was made even as ever cash-strapped Cuba has fallen behind on its debt to nations and multinational corporations amid the global recession. The Bolivarian Alternative for the Americas trade group is holding a two-day summit starting Sunday in the Cuban capital. The group was formed by Venezuela’s self-described socialist president, Hugo Chavez, as an alternative to U.S.-backed free-trade consortiums. Member nations are Venezuela, Cuba, Nicaragua, Honduras, Ecuador, Bolivia, Antigua and Barbuda, San Vincent and the Grenadines, and Dominica. Honduras remains part of the bloc despite a June coup that toppled leftist President Manuel Zelaya. Zelaya’s deposed foreign minister is attending the summit, but the acting government in Honduras will almost certainly not abide by any agreements made. 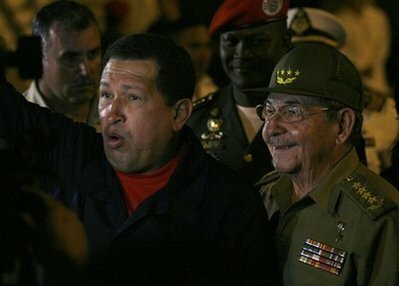 Chavez was greeted Friday as he arrived in Cuba by President Raul Castro. Cuba and Venezuela signed “agreements of cooperation” on 285 bilateral projects in 2010 totaling nearly US$3.2 billion, according to Venezuelan Energy Minister Rafael Ramirez. He provided no details on what those agreements entail, however. Leftist presidents Daniel Ortega of Nicaragua and Evo Morales of Bolivia are expected to attend the summit. Colonel Gaddafi proposed an African-Latin American defence alliance yesterday at an intercontinental summit hosted by Venezuela. At the South America-Africa summit on Isla Margarita in Venezuela, the Libyan leader joined the host, President Chávez, in calling for an “anti-imperialist” front across Africa and Latin America. President Mugabe of Zimbabwe and President Zuma of South Africa were among almost 30 leaders from across the two continents present as Mr Chávez sought to promote his socialist policies abroad, urging a new world order that would confront Western dominance. “The world’s powers want to continue to hold on to their power,” said Mr Gaddafi, who had a white limousine flown to Venezuela to meet him at the airport. He then met Mr Chávez in his trademark Beduin tent by a hotel pool. “Now we have to fight to build our own power,” he said. The leaders were to agree a range of joint projects in areas including energy, mining and agriculture, with Mr Gaddafi, in particular, expected to sign several accords with Mr Chávez. Venezuela also stoked the controversy over the Iranian nuclear programme with the revelation that it was working with Tehran to exploit its uranium deposits. Rodolfo Sanz, the Mining Minister, said that Iran was helping Venezuela to detect resources, raising international suspicions at a time when voices in Israel and the United States are accusing Caracas of helping its ally to evade sanctions on its nuclear programme. Brazilian President Luiz Inacio Lula da Silva speaks during the 64th United Nations General Assembly September 23, 2009 at UN headquarters in New York. Getty Images. The Brazilian president calls for a new world order in global economy, which gives developing countries more control over the World Bank and the IMF. Luiz Inacio Lula da Silva, addressing the United Nations General Assembly on Wednesday, insisted that every country should play its role in overhauling the interdependent global economy. “Because the global economy is interdependent, we are obliged to intervene across national borders and must therefore re-found the world economic order,” he said, according to AFP. Lula further underlined that the world leaders should go ahead with regulating the financial markets and putting an end to protectionism. He called for international financial entities such as the International Monetary Fund (IMF) and the World Bank to be “more representative and democratic” and to give poor and developing countries a due share if they want to overhaul the global financial system. “Poor and developing countries must increase their share of control in the IMF and the World Bank,” he said. Lula is going to represent his country as an emerging economy at the G20 summit later week in Pittsburg with US President Barack Obama hosting the event. Chavez has governed for just over 10 years and makes no bones about his aim to stay in office for decades more while he works to turn Venezuela into a socialist state. PORLAMAR, Venezuela (Reuters) – Venezuelan President Hugo Chavez hosted some of Africa’s longest-serving leaders at a sleek Caribbean resort on Saturday for a summit he says will help end U.S. and European economic dominance. High-profile guests included Libya’s Muammar Gaddafi, who is celebrating four decades in office and had a white limousine flown to Venezuela to meet him at the airport, and 85-year-old Robert Mugabe, who has ruled Zimbabwe since leading it from British colonialism nearly 30 years back. He said the two-day meeting of African and South American leaders, which also includes many recently elected presidents, would help the mainly poor nations build stronger trade ties and rely less on Europe and the United States. Chavez said Europe and the United States were empires that have imposed poverty on much of the world. The presidents of Brazil and South Africa also attended the summit. Their model of business-friendly economics mixed with a focus on the poor is more popular among many African countries than Chavez’s radical message. Some analysts say the developing economies of Brazil, Russia, India and China, known as BRIC nations, could eclipse the economies of the world’s richest countries by 2050. The leaders at the summit were likely to agree on supporting stronger links between the two continents and calling for reform of global institutions like the United Nations and World Bank to give poor countries more clout. Gaddafi, whose entourage arrived in two matching Airbus passenger jets and pitched a large Bedouin tent beside the Hilton’s pool, on Wednesday told the United Nations that big powers had betrayed the U.N. charter with their vetoes and sanctions. King Mswati III of Swaziland, who was crowned in 1987, was also due to appear on Margarita, along with the leaders of Equatorial Guinea, Angola and Algeria, among others. In total, 28 African and South American leaders were expected to be present by Saturday afternoon. Chavez seems to be going all out to provoke his foes. On Friday, Venezuela said Iran helped identify its uranium reserves, just hours after the West accused Tehran of building a secret nuclear fuel plant. Chavez says he opposes nuclear weapons, but that the developed world does not have the right to stop other countries from developing nuclear energy for peaceful purposes. A major oil exporter, Venezuela is seeking to widen Chavez’s ALBA alliance of mainly Latin American leftist governments to include African states. Chavez promised this month to build a refinery in Mauritania and sell crude to Mali and Niger in West Africa, a region that is emerging as a major new oil frontier considered of strategic importance to oil companies. PORLAMAR, Venezuela — Some 30 African and South American leaders are seeking to build on their alliances at a summit that gives Venezuelan President Hugo Chavez a chance to extend his influence across the Atlantic. Libya’s Moammar Gadhafi, on his first visit to the Americas, set up camp in a trademark Bedouin tent and met with Chavez inside it Friday night. Other leaders also held talks in private ahead of the summit’s start on Saturday. The two-day meeting on Venezuela’s Margarita Island is aimed at addressing a wide range of common concerns, from poverty solutions to calls for reform at the United Nations. Presidents are discussing plans for cooperation in energy, trade, finance, agriculture, mining, education and other areas. “South-South” cooperation has been a buzzword at the summit, which brings together two regional blocs: the African Union and South America’s fledgling Unasur group. African leaders including Zimbabwe’s Robert Mugabe and Algeria’s Abdelaziz Bouteflika gathered at a beachside hotel amid crowds of bodyguards and aides. South American presidents from Brazil’s Luiz Inacio Lula da Silva to Bolivia’s Evo Morales were also attending.